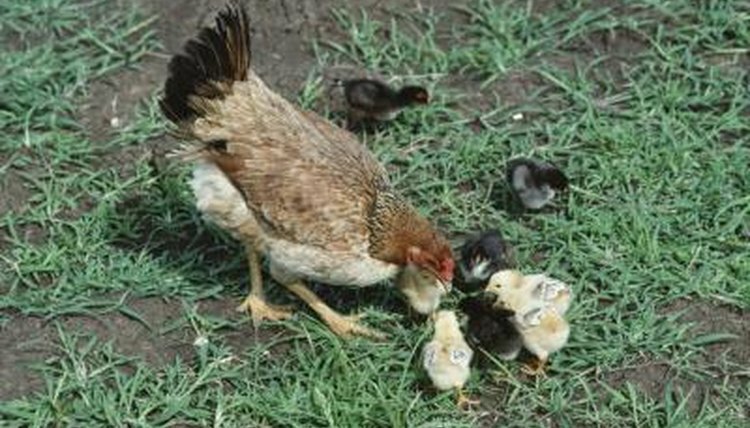 The broody hen will sit on a clutch of eggs for 21 days for large fowl and19 to 20 days for bantams, providing the heat for the embryos to develop. After the eggs hatch, she will care for the chicks. During this time, a safe environment, food and daily care are needed. The broody will be happier if moved to a box and kept in a quiet, secure place, out of direct sunlight. If hens sit together, they constantly steal each others eggs. The broody box can be wooden or cardboard, about 18 inches square, well ventilated and lined with wood shavings or short straw. It's advisable to dust the broody with anti-lice powder so she isn't driven mad by fleas or lice while sitting. For a day or two, fake eggs or golf balls can be placed under her to check if the hen will settle. If she does,10 to 12 fertilized eggs for a large fowl, or six to eight for a bantam, cleaned with specialist egg disinfectant, can replace the dummies. The eggs need to be fresh -- no more than a week old. During the sitting period, at a regular time each day, lift the broody from her box and take her outside for 20 to 30 minutes, to eat, drink, defecate and have a dust bath. Feed her straight wheat, and provide fresh water and grit. Any soiled nesting material should be removed or the eggs may become contaminated. If the hen throws out an egg, try replacing it under her. If she won't accept it, the egg is probably infertile and can be discarded. A few days before hatching, sprinkle the eggs daily with a few drops of warm water to create the correct humidity. Do this when the broody is returning to her nest after a break and the eggs won't become chilled. On hatch day try not to disturb the broody too much. When lifting the hen to check on progress, watch out for chicks under her wings. Remove empty shells or they may encase unhatched eggs. The hatch can take up to 48 hours. Any eggs left behind can be discarded when cold as the hen wouldn't leave live eggs. When the chicks are dry and fluffy, move them along with their mother, to a broody coop. A small rabbit hutch, with a wired over run, works well. Keep the run small, as chicks chill quickly if separated from the broody's warmth for long. Newspaper with chopped straw on top makes good bedding for the coop. Fresh water should be provided in a shallow dish or proper chick font so the chicks can't drown. They can be fed ad lib or three times a day with chick crumb, a formulated feed, which is 20 to 22 percent protein. The hen will scratch food into the litter encouraging the chicks to eat. Grain should be put out for the hen. When the chicks are 3 weeks old give them a larger run. Introduce them gradually to eating growers pellets at 6 weeks old. The hen and chicks can be let out with the flock when the chicks are about 8 weeks. The hen will stay close at first, then leave them for periods, before returning to the flock full time.